3.86 x 2.36 x 0.55"
Do you have an ETA on when this will be available? How do I go about putting a header on it? 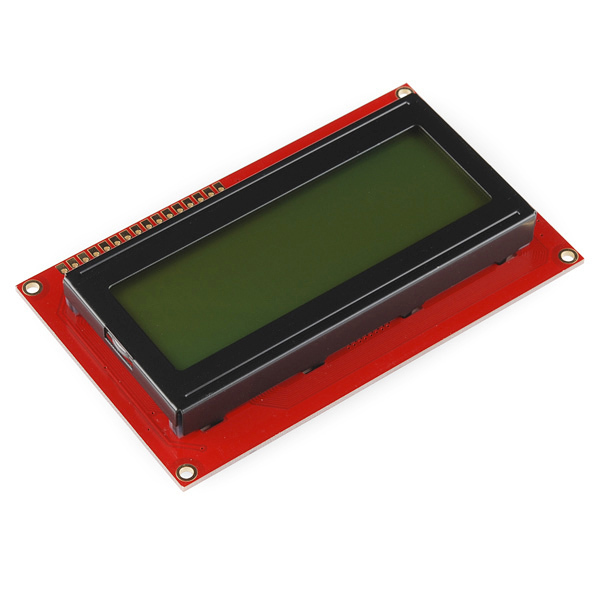 Adding to what N1VG posted, you can indeed control this module, or any other HD47780-based character LCD module for that matter, with six lines. If you're using an Arduino as the brains for your project, the LiquidCrystal library that comes with the Arduino IDE will run a HD47780-based module from six pins without having to manage things like passing nybbles to the module - you can just include LiquidCrystal.h, declare a new object (e.g., LiquidCrystal lcd(2,3,4,5,6,7); to use pins 2-7 to control the module), and just shoot data to it with the print() and write() commands. The library will handle the rest. Is there an Eagle file for this LCD? I can't seem to find it anywhere. Sorry, we don't have the whole board in Eagle yet. You could use a generic 16-pin 0.1"-spaced header for the connector though. Not sure if this is normal. My LCD, using the liquidcrystal library, wraps to the third line after finishing the first (then it goes to the second, then the fourth), but addressing each line is normal when using setCursor(). I experienced the same. Did you get additional information? I am still trying to find a solution to no avail so far. Keep on posting.. The "solution" I came up with was simply to use the cursor positioning feature to write to the lines I wanted. Since you're writing strings anyway, it's not terribly difficult to do. If you're making a display for a project, just account for what ends up on what line. I can't help you if you need upward-scrolling text. You could try to modify the liquidcrystal library to handle it all on the arduino, but that seems like more effort than it's worth. Old post, Always check with Digi-Key. They have flat cable assemblies from Tyco for about 11 bucks each for a 6 inch cable (A9BBG-1606F-ND). Can anyone confirm if this works with an Arduino Uno? Following these directions (http://arduino.cc/en/Tutorial/LiquidCrystal), no matter what I do I can only see solid blocks on two of the 4 rows when the pot is turned all the way down. Is this because the Arduino library is for a 16x2 character LCD and this one is a 20x4? You probably need to adjust the brightness. Sounds like it is set to max. I got mine to work with the LiquidCrystal library on a Uno and using all 20x4 chars. I forgot to buy breakaway male header pins for this LCD module. However, I do have spare female headers from a previous project. Would I be able to use the female headers? How would I use this with the serial backpack? You simply solder the backpack to the display. Note that we also carry serial displays with the backpack functionality built-in. Rookie question, what's the difference between this and serial? I plan to just be hooking this up to outputs from my ATMega328. What else do I need to make this work? 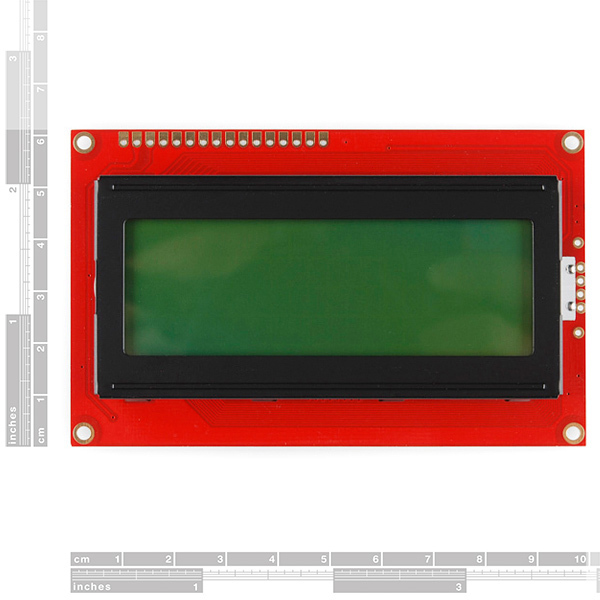 This display has a parallel interface, so it will require about 6 I/O pins to run. 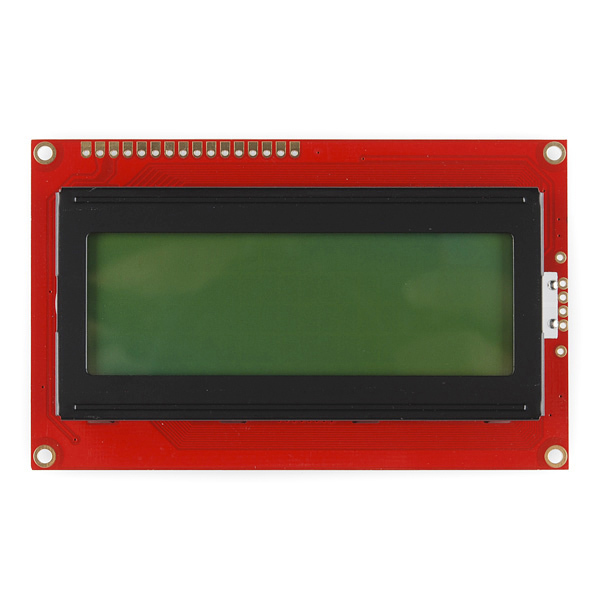 The parallel protocol is complex, but there are good LCD libraries out there which make it easy to use. The difference between this and a serial display is that the serial display will only require one I/O pin. If you use straight headers, the clips used to anchor the lcd to the board get in the way when you try to plug it into a breadboard with power rails on the side. You'll want to use right angle headers or a breadboard with no power rails. I would definitely like to have a 3.3v version of this. Other colors (black/white or black/red) would be nice too. The 3.3v is a higher priority for me though. Any possibility of more colours...? and / or a 3.3v version? Isn't the LED forward voltage supposed to be the same as the backlight supply voltage? They're different. And how would you drive the backlight with 150mA? 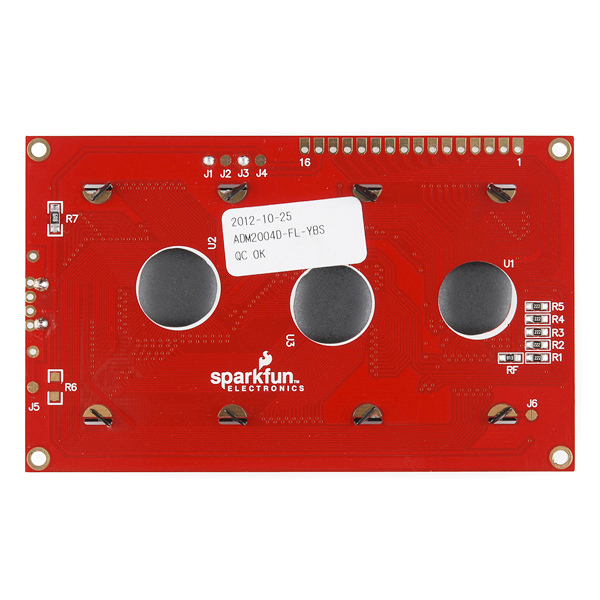 If you have specific questions about this product, please email tech support directly at techsupport@sparkfun.com. Can anyone tell me what size resistor to use when using the back light, or is the resistor built-in? @Twiddler: Yes, it's possible to write too fast. Check the write cycle timings in the datasheet. The enable signal can't be cycled faster than 2MHz. Also after each command sent to the LCD, you have to wait until the busy flag is clear, or delay several microseconds to milliseconds (depending on which command). I am having loads of trouble with these. Is it possible to send data to them too quickly? I am counting pulses and when it really gets going, the screens go crazy. I can't figure it out. Has anyone got an Eagle or Gerber file for this? Thanks!